Janne Hansen grew up in Kongsberg, a part of Norway known for its beautiful woods and mountains. She has always been fond of writing lyrics, and has a background as an astrologer. To start singing was a new experience for Janne, who had no previous experience from the world of music. The CD was produced in 1500 ex and was sold out shortly after the release. "Colours" then decided to close down their record company, and the CD-EP was never reproduced. In 1998 the duo decided to record a full album and released their new CD "Killandra" on their own record company "The Holly". "Killandra" consists of 11 songs, ranging from 3 to nearly 7 minutes. The music and lyrics were inspired by the scenery of the Norwegian landscape, fairy tales and mysticism. The lyrics was also influenced by astrological symbols and the rune stones. The music could be described as a blend between Norwegian and Irish folk tunes, with hints of progressiv, and was a warm and delicate album. Among the instruments used were: violin (Mr Trond Villa from the legendary Norwegian folk-rock band Folque), flutes, saxophone, mandolin, percussions, accoustic/el.guitars and mellotron. become a legend among pixies and trolls. - "My favourite track is Dusk -a beautifully mystical piece pairing atmospheric keyboards, violin and sax with fabulous lyrical imagery"
- "You get the picture: mystic, magical, enchanting music. All good reasons to give this record a try"
- "SHINE DIÓN a réussi un album rutilant de beauté mystique et naturiste,un élan du cæur d'où la sensation de pureté émane à chaque note. Une esquisse d'éternité sereine flotte sur les guitares de Selör et la voix de Hansen. Abreuvezvous à leur source, elle est d'une éternelle jouvence! France. "Killandra" was also released on vinyl LP by Black Widow Records. Shine Dión released their third CD in February 2002. The title was "WYN". The title is an old english name for a rune sign. The rune symbolizes joy and a new life unfolding. 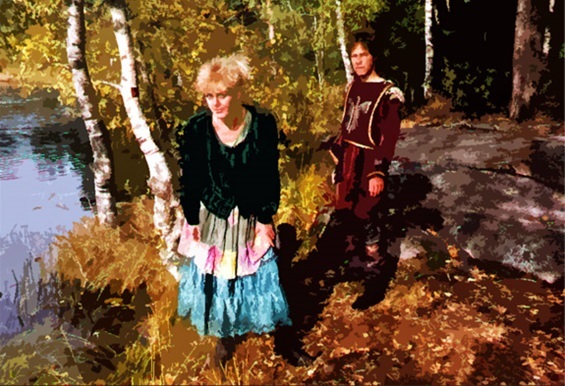 The lyrics on the CD were inspired by the norwegian landscapes and the tradition of fairy tales. The music blended elements from norwegian and celtic folktunes in a contemperary way, with hints of progresssiv. The CD consisted of 10 songs, all written and produced by Shine Dión. The CD was also produced on license by Si-Wan Records in Korea. In April 2005 Shine Dión released a promotion single to the radio stations in Norway. The single consisted of 2 songs. "Secret Lullabye" was made and produced by Shine Dión. The second song was the first cover version ever done by Shine Dión. The song was "Somewhere Along The Road" written by Steeleye Span bassist Rick Kemp. In 2012 Shine Dión contributed with the song The Well on the CD Musica Keltika Vol.1 released by Miroque, Histomedia. Other artist on the CD are Loreena McKennitt, Nolween Leroy and Julie Fowlis.